Agudah to Department of Treasury: Don’t Let SALT Jeopardize Scholarship Tax Credit Programs! WASHINGTON — Agudath Israel of America testified today before the U.S. Department of Treasury, asking the IRS to ensure that recently proposed tax regulations do not negatively impact school choice programs across the country. The proposal was meant to block attempts by certain states that were trying to get around the new federal tax law’s $10,000 cap on the State and Local Tax (SALT) deduction. The states wanted to allow taxpayers to allocate certain state taxes as a “charitable contribution,” which, unlike taxes, would not be subject to the SALT cap. The IRS responded by proposing rules that would require taxpayers to subtract the full state tax credit – including those granted for donations to state scholarship funds – from their federal charitable contribution, thus reducing or eliminating the value of the contribution and relevant deduction. 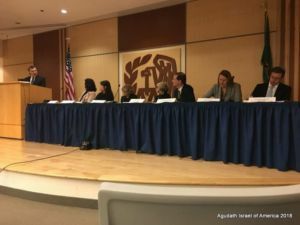 More than a dozen witnesses, ranging from parents to national organizations like Agudath Israel, expressed concern that the proposed rules would have a devastating effect on scholarship tax credit programs. These programs, currently operating in 18 states, offer taxpayers a state tax credit, generally ranging from 50-100%, in return for a donation to a scholarship granting organization. Scholarship organizations then distribute those funds to eligible students to attend the private school of their choice. Many of the witnesses pointed out that if donors were prevented from taking a federal deduction for those contributions, some would withhold future contributions, leaving thousands of low-income students without a scholarship. Rabbi Cohen debunked some of the myths and arguments put forward by those opposed to giving students educational options. He urged the panel to find a way to achieve Treasury’s stated policy goal of stopping tax workaround schemes without dragging school choice programs into the final regulations.